Browsers, Clouds & Computing: GTUG Meetup on Google Apps Script: A Review. GTUG Meetup on Google Apps Script: A Review. 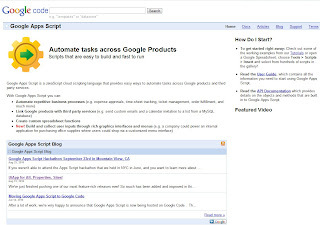 This meeting on 6 October 2010 was primarily about Google Apps Script by Martin Omander, Developer Advocate at Google. After a greeting by Van Riper, lead organizer of the Silicon Valley GTUG Meetup Group, the following initial announcements were made. Bess Ho gave out the discount code for Paypal X Innovate conference; also mentioned games design, Oct 12. Kevin Nilson talked about the upcoming Silicon Valley Code Camp, October 9-10. Wesley Chun, the chief organizer of the Google tracks in the camp, briefed the audience on what is to come in those tracks. Subsequently, Martin went through examples of different functions created by Google and others in the Script Gallery, e.g., =weather(), =getTweets(). He also went through a simple mail merge example. He mentioned that Motorola has created IT portfolio tracking system in Google Apps Script. When asked what kinds of debugging facilities existed, he showed the debug icon in the script editor window, but it wouldn't work for some reason. If you submitted your own application or scripts to the gallery, then others could make use of your submitted functionality through an URL. Fusion table support is not yet available. Is there a published roadmap? No. Martin hoped they will get to it some day. Can you access spreadsheet visualization application? Martin didn't know. Karl Pohl, an independent software engineer, who has created stock portfolio analysis application using Google Apps Script. At the moment, he wants to keep the application for himself, thank you very much, as he has been able to extract 'good' money from the stock market using his Google Apps Script implementation. Paul Masquelier has uploaded the photographs that were taken at the event. Overall, a very good introduction to the subject matter of Google Apps Script.